The recent surge of roguelike titles that has washed over Steam these past few weeks is quite incredible. Between Rogue Islands, Caveblazers, Oafmatch with its roguelike mode, and now Monolith I have been on quite a roguelike adventure as of late. Monolith is being developed and published by indie developer Team D-13 and is scheduled for release June 7th on Steam for PC. 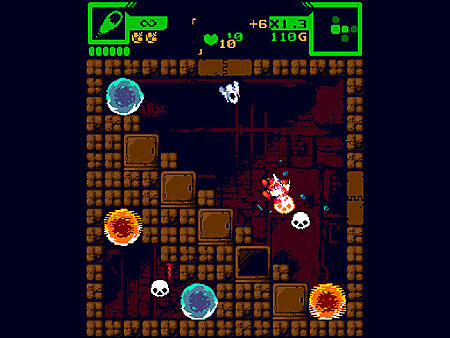 It's a roguelike that combines the level design and mechanics of The Binding of Isaac with shoot'em up gameplay. What we get is a unique take on a classic formula that brings a good dose of content with a tremendous amount of fun. Despite the impressive quality of the roguelike games I have played recently, Monolith stands as one of my favorite titles in the genre this year. Disclaimer: This preview covers an in-development build of the game and does not represent a finished or complete product. In Monolith you take control of a little ship as it attempts to battle its way to the depth of a long-abandoned facility in search of wealth, power and scattered pieces of the past. 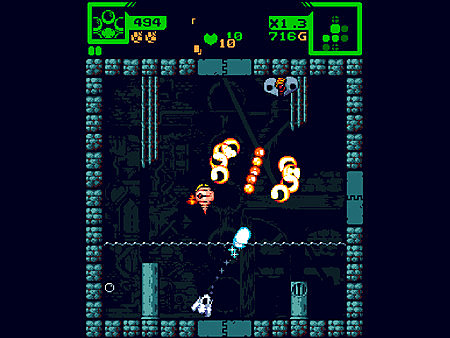 Descending into the facility works in similar fashion to The Binding of Isaac, where the player must go from room to room and clear out all enemies before being able to progress to the next. 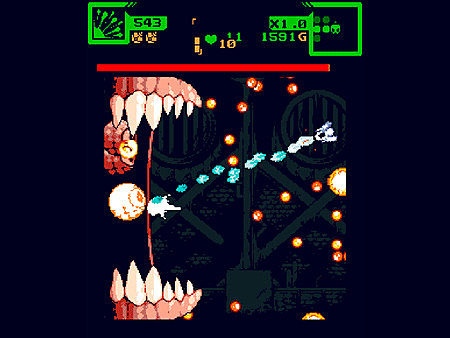 In order to delve deeper into the facility, the player must take on one of the many varying bosses that the game has. The difference between TBoI and Monolith, however, is that the player must first destroy the Nimbus (minibosses) on the floor before being able to fight the boss. Throughout your travels, you uncover secret areas with power-ups, purchase items from shady merchants, receive upgrades and unlock vaults containing treasures and lost technology, all done in similar fashion to TBoI. As for the shoot'em up gameplay, this is pretty much what you would expect from the genre. The combat of the game is fast paced, with room-filling projectiles to dodge as they are fired left, right and center by the enemy -- and with you firing back. To help you avoid enemy fire you can dash a short distance. This is useful for making your way to an area close to you that isn't full of enemy bullets. There is no mistaking The Binding of Isaac's influence in the design of Monolith but that doesn't mean its gameplay isn't fun. It is much faster paced and more action packed, catering to those with an itchy trigger finger. This is even more evident with the ability to instantly teleport to any room you have already cleared using your map, putting a stop to prolonged backtracking. 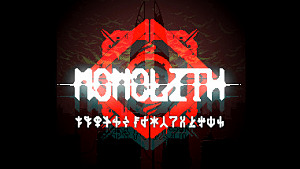 Monolith may look like a complete clone of the game from which it draws inspiration. But once you really get into the game and see what lays beneath its covers, you begin to see the difference between the two and where it really shines. The most glaring feature that separates Monolith from TBoI is that the combat is in the form of a shoot'em up. Just like the many games of the genre, you can expect there to be numerous powerful -- and at times outright crazy -- weapons to wield. Essentially there are a number of different weapons that function in a particular manner, such as Revolver, Vulcan and Laser. The revolver, for example, fires a number of rounds before needing to reload. The Vulcan is a constant rapid firing weapon. And the laser is a short burst weapon. When you find one of these weapons, they have a number of randomly generated properties added to them, that causes them to act differently. For example, a laser weapon could have three beams that each bounce off walls as opposed to just one single beam, or the Vulcan can turn into a Gatling gun that then spreads into multiple bullets upon impact. Technically speaking there are only a handful of weapons, but with the many properties that are applied to them, you have a massive array of different weapons at your disposal. 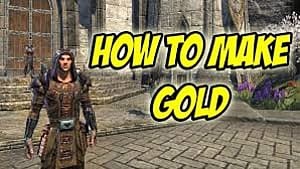 The best thing of all is that you never really know just what kind of weapon you are going to end up using, and each changes up the gameplay considerably. Another major difference in Monolith is that you receive money (aka debris) by defeating enemies. 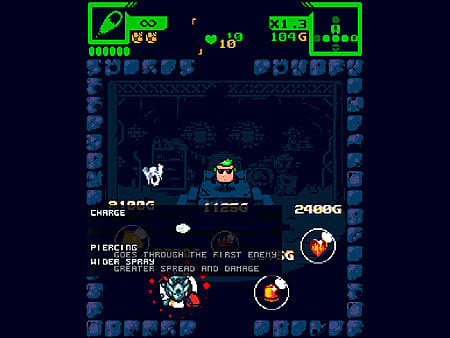 This can then be used to buy additional supplies from shops found throughout each of the levels. How much debris you gain from an enemy depends on your multiplier at the top of the screen. You gain 0.1 per enemy killed, up to a maximum of 2.5. If you are hit the multiplier is lowered by 1.0. 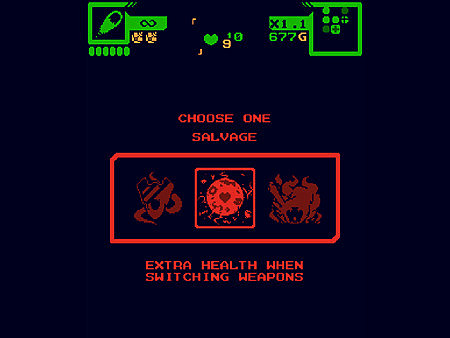 This mechanic rewards the player for their skill and ability to progress while keeping health loss to a minimum. Not only that, but it allows for more purchases in the shops -- giving the player even more advantages throughout the playthrough. Any money you come across is also placed in your bank, which can then be used to unlock new upgrades and weapon modifications from an orange cat at the start of each playthrough. These unlockables add even more gameplay changes, to make each run different from the others. The final thing that really gives Monolith its own identity is the whole atmosphere and theme of the game. While TBoI is dark and disturbing, Monolith is a lot more joyful and light-hearted -- even when facing off against the more horrifying bosses. Once you have looked deeper than how the game first appears, you do find something really different and unique that can only be compared to its inspiration in a few minor ways. As you would expect from a roguelike game, Monolith isn't a title that caters to more casual gamers. In fact, it is probably one of the most difficult titles in the genre right now, but that doesn't mean it isn't fair. With its shoot'em up gameplay, the sheer amount of enemy fire you need to avoid in Monolith is at times quite ludicrous. Unless you have the superpower of bullet time you will be taking damage, especially in the boss fights. 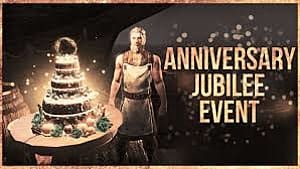 But with all that said, the game does give more than enough supplies to the player, particularly if they are clever about how they go about things and use ship upgrades to their advantage. As can be expected, the game's RNG does make you slightly stronger at times, and slightly weaker at others. But unlike a lot of titles, there isn't as much of a gap where you become a powerhouse or so weak it would be best to just end the run. No matter the situation, there is always a possibility to win -- it just depends on your experience and skill with the game. So yes, it is a difficult game, but a fair one. It really has been a busy year in the roguelike genre, but I can say with utmost confidence that Monolith is one of the most fun of the many titles that have been released so far this year. With so many crazy weapon combinations, a wonderful cast of enemies and bosses, good in-game balance, and an awesome soundtrack, there really isn't much to not like about the game. Sure there are a few tweaks that could be made here and there before the game releases, but nothing worth mentioning. 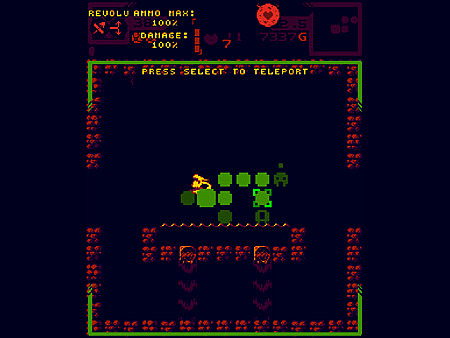 If you love roguelikes, you will love this game. 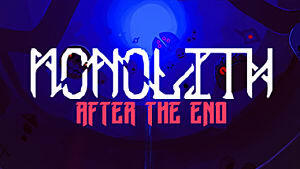 And if you enjoy shoot'em ups, you will enjoy Monolith also. But if difficult games that require quick reflexes and have tons of bullets coming at you all the time aren't for you, then the chances are you will not have fun with this. Monolith will be available to buy on Steam June 7th. 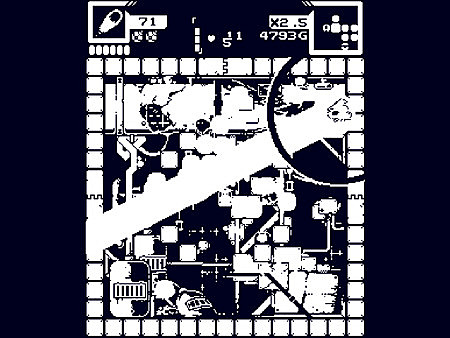 Note: A copy of the game was provided to the writer for the purpose of this preview.